Last Sunday I hosted the Sepia Mutiny Brooklyn Meet Up. More on that here. A total of 14 very interesting people turned up. Besides the food and the wine and the beer, there was a lot of interesting discussions, with a slight India bent of mind. One of the participants was Nina Paley, an American illustrator who is working on a very interesting project which has been featured on the blogosphere a while ago. “Sita Sings the Blues” is her latest project, which shall be featured in the upcoming IAAC filmfest in November. The animated movie is “a new twist on an old myth by Nina Paley” as her website informs us. Nina also blogs regularly. Her video clips of “Sita Sings the Blues” are downloadable on her site and are highly recommended. On the subject of animated mythologies, I stumbled upon another site, by a young graphic designer Garima Saxena. 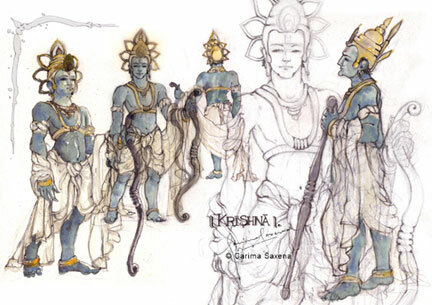 Her sketches about Krishna are compelling. Chiraag Bhakta was present at the party and had some really interesting stories to tell. His work is just fantastic as can be seen from his site. He is also related to Raj Bhakta, he of the Apprentice Fame, as seen here on NBC’s official website. Chiraag designed this crest which became very famous on the show. We got to know that this is the family crest for the Bhakta family.